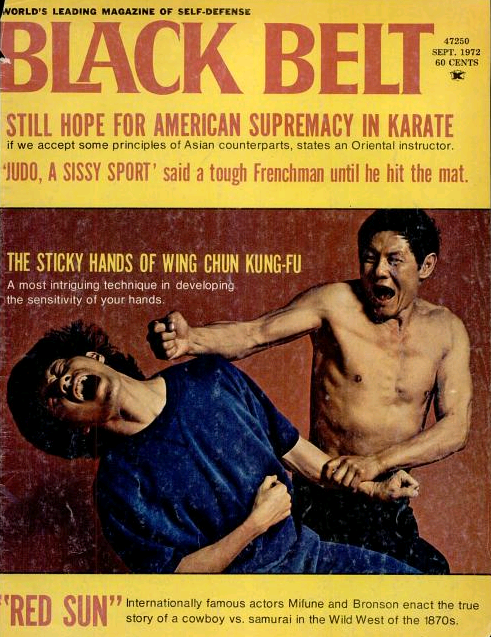 Cover of “Black Belt Magazine.” September, 1972. Source: Google Books. In the first part of this series (which you can read here) we discussed the earliest works on the Chinese martial arts to appear in English, and looked at two sources on Wing Chun. The first was an article in a 1968 edition of Black Belt Magazine (the publication of record for the American martial arts community at the time) and the second was Wing-Chun Kung-Fu: Chinese Self-Defence Methods by R. Clausnitzer and Greco Wong (1969). These works are the two oldest treatments of Wing Chun in the English, and they are some of the earliest published sources on the art that we have in any language. They are interesting to review precisely because of their early date. Bruce Lee, while known to many martial artists and through his role as Kato, had not yet broken out and become a house hold name. Likewise, while there was a decided uptick of interest in the Chinese martial arts from the early 1960s onward, we were still three to four years away from the explosion of the “Kung Fu Craze” of the 1970s. In Parts II and III of this series we will examine the next generation of early publications on Wing Chun. At least a few of these works may have been in planning prior to Bruce Lee’s eruption into the general popular consciousness. Nevertheless, in their final incarnation each of them shows an awareness of the changed nature of the popular culture landscape. Some of these authors seek to provide guidance to the inexperienced in an effort to help them avoid the many poor instructors who appeared almost overnight in the early 1970s. In other cases these authors sought to put themselves at the forefront of a rising tide of interest in the Chinese martial arts. Lastly, a few individuals used both books and magazine articles to attempt to claim the leadership of the Wing Chun movement (at least in the English speaking world) following Ip Man’s death from throat cancer in 1972. In this post we will focus on Wing Chun Kung-Fu by James Yimm Lee (Ohara Publishers, 1972). In Part III of the series we will go on to cover Kung Fu for Young People: the Ving Tsun System by Russell Kozuki and Douglas Lee (1975) and Secret Techniques of Wing Chun Kung Fu by K. T. Chao and J. E. Weakland (1976). Note that Parts II-III will cover only the first few years of the “Kung Fu Craze.” Many more articles and books on Wing Chun were published in the later 1970s and early 1980s. Nevertheless, these three works really set the terms (and in some cases even the technical vocabulary) for many of the debates that would follow. For that reason alone they deserve careful consideration by anyone interested in the development of Wing Chun (and the Chinese martial arts) in the west. I should note two additional points before going on. This series will basically provide a chronological overview of the five earliest Wing Chun publications with one exception. In 1974 Moy Yat (an Ip Man student then living in New York City) published a very brief work titled 108 Muk Yan Jong. The work contained only 79 pages, most of which featured images of the wooden dummy form being performed by Lee Sai Jow. The book was published in Hong Kong by the Tak Shing printing company and was accompanied with minimal text. Its most valuable lasting contribution was probably the set of detailed plans for the construction of a wooden dummy that it featured in the back. I am not including this book in the current series of reviews for two reasons. To begin with it was aimed at individuals who were already a part of the Wing Chun system. Secondly, I am not sure how much of a substantive impact it actually had. After years of looking I have never located a copy of the original edition. Kung Fu for Young People was written by a Moy Yat student (Douglas Lee) and that work seems to have reached a much larger audience. Greco Wong, who we discussed in Part I, was also one of Moy Yat’s most senior students from his period of teaching in Hong Kong (roughly 1962-1973). As such I have decided to focus on these two works which enjoyed a somewhat wider distribution. Lastly, it should be remembered that most of the readers that we will be discussing in Parts II and III of this series were pure beginners. Their first exposure to the martial arts was usually through either film or television. That was not necessarily the case in Part I. In that post we saw two printed works that were promoting the Chinese martial arts on a much smaller scale and somewhat independently of major media trends. Yet in the years between 1972 and 1976 things started to change very rapidly. The printed works on Wing Chun produced during this period were now just one part of a much larger social movement. They did not really drive the mania around Bruce Lee or Kung Fu, but they helped to fill out the initial vision and provide basic resources to the legions of newly minted martial artists that arose in this era. A portrait of James Yim Lee. James Yimm Lee, An American Kung Fu Pioneer. Wing Chun Kung-Fu by James Yimm Lee (Ohara Publications, 1972) may not actually be the first book on Wing Chun, but it is the one that everyone remembers. Its stark green cover provided the first glimpse that many seekers ever encountered of this new and mysterious art. The dramatic, over-acted, expressions of the two figures on the cover seemed calculated to tap into the image of machismo unleashed by Bruce Lee. While “Enter the Dragon” had not yet been completed, his other films were setting box office records across Asia. They were even getting some coverage in American publications. This was an image of Kung Fu that matched the spirit of the time. Still, it would be a mistake to judge this book solely by its cover or to assume that James Lee himself was in away selling hype. His name and “hype” just do not fit together in the same sentence. Lee was truly a pioneer of the Chinese martial arts in America. He was an extremely hardworking, dedicated and loyal individual who expected to see those same traits in those around him. He was also one of the most experienced and well-connected martial artists that one was likely to run into in the 1960s. Lee had been interested in the martial arts since he was a child. During WWII he, like so many other military men, was exposed to Judo and boxing. Lee eventually ended up earning a brown belt in the Japanese art before moving on to other studies. His interests in physical fitness were wide-ranging and very modern. He was an advocate of both scientific nutrition and weight lifting. He actually ran a gym at one point. Lee was also among the first wave of American students to study the traditional Chinese martial arts in the US. By the late 1950s Lee was already something of an expert in martial arts circles. Earlier in the decade he had begun to write and self-publish a number of short, no-nonsense manuals on different aspects of the martial arts. These were sold through advertisements placed in publications like Popular Mechanics. This hard won writing and publishing experience served him well, and it enabled him to help other martial artists, like Bruce Lee (no relation), get their own ideas out into the market. In 1957 James Lee turned his attention squarely to the Chinese martial arts. He began to study a compound Shaolin system (possibly a combination of Hung Gar and Choy Gar) with T. Y. Wong in San Francisco’s Chinatown. He even helped his teacher to publish one of the first books on the Southern Chinese martial arts in English (Chinese Karate Kung-Fu: Original “Sil Lum” System, For Health and Self Defense, 1961). Lee (using his Chinese name) is listed as a co-author on the cover. Nevertheless, his association with the more elaborate Shaolin arts did not survive his first meeting with the young Bruce Lee. He was impressed with not just Bruce’s physical grace, but also the pure practicality of his approach to the martial arts. James Lee himself was nothing if not practical. He was immediately attracted to the simplicity of Wing Chun, its raw aggression (at least in Bruce’s treatment of the system) and its unrelenting emphasis on actual violence and self-defense. James and Bruce’s relationship went well beyond “teacher and student” or even “colleague.” James’ wife lent her wedding ring to Bruce and Linda for their marriage shortly before she died of cancer at a tragically young age. After leaving Seattle for Oakland Bruce and Linda moved in with the recently widowed James. They worked, taught and lived together for a number of years. It was during this time that Jeet Kune Do really began to evolve. But at the same time James Lee was also taking extensive notes on Bruce’s original Wing Chun style. He states in the introduction of his book that he had hoped to teach the original art to son. But the notes ended up becoming the core of a work that would reach a much broader audience. Wing Chun Kung-Fu was perfectly positioned to ride the wave of “Bruce Lee mania” that started in 1973. It was already published and one the shelves by the time that fans started to ask serious questions about Bruce’s background and training. Unfortunately neither man would live to see the success of this small volume. The circumstances of Bruce Lee’s death are well known. James died of lung cancer, evidently a victim of the industrial chemicals he encountered in his career as a welder, a year earlier in 1972. He was only 52 at the time. Of course the success of his small volume did not come about by magic. Ohara Publications used its relationship with “Black Belt Magazine” (both had the same owners) to heavily advertise the book. The cover of the September 1972 issue was basically a page long full color advertisement for the new publication mailed to every newsstand, drugstore, martial arts school and library in the country. While Ohara promoted a number of their own books in the magazine, few enjoyed quite the publicity that James Lee’s volume received. Given how important this issue of “Black Belt” was to the ultimate success of the book, I would like to take a moment to examine it in a little more detail. This is a valuable exercise for a number of reasons. Doing so reveals not only the advertising that helped to launch Wing Chun, but also the growing interest in the Chinese martial arts more generally. As I mentioned in the previous post, this trend probably dates back to the 1950s and it was noticeable in the period’s literature and ephemera by the middle of the 1960s. However, by the early 1970s (still prior to “Enter the Dragon”) the Chinese arts had achieved a noticeable level of recognition among practicing martial artists. For instance, the September 1972 issue of “Black Belt” offered readers six full length articles. Two of these focused on Judo, one on a “Korean Karate” (Tae Kwon Do) system, a review of the samurai/cowboy film “Red Sun” and two articles on the traditional Chinese martial arts. The entire layout of this magazine is remarkable not just for what it says about the state of Wing Chun in 1972, but the Chinese martial arts as a whole. About one third of the total column inches of space in the articles were dedicated to the Chinese martial arts. Half of the magazine focused on subjects that fell outside of the traditional sphere of the Japanese martial arts. This balance is pretty typical of the period, but it was a sharp departure from the magazine’s early days in the 1960s when readers could reasonably expect that every article in a given issue would focus on a Japanese art (usually Judo, then Karate, Aikido and Kendo). Even before the explosion of the “Kung Fu craze,” the interests of western martial artists were becoming more global. For example, one of the Judo articles in the September 1972 issue, while still about a Japanese art, focused exclusively on the experiences of a European instructor in France. The actual copy of the Wing Chun story was written by Peter Bennet. At the time James Lee was very ill. He would ultimately die within a few months of the release of this issue. It began with a brief recap of the Yim Wing Chun legend, and then moved on to a quick introduction to Ip Man and the role of Chi Sao in training. The discussion was illustrated with a series of photos (labeled in Chinese) showing Ip Man and Bruce Lee demonstrating dan chi sao (single armed sticking hands). After the first two pages the article shifts gears, and presents an excerpt from the book in which James Lee demonstrates some simple techniques for simultaneous attack and defense in each of the “four corners.” The photography is clear and self-explanatory. The text is minimal but it does introduce a conceptual discussion of the four gates and some of the technical vocabulary associated with different hand techniques of the southern Chinese martial arts. The final page of the article is shared with the column “Budo Breeze” by Mitch Stom. This feature was basically a news blotter with some editorial commentary. Again, it is interesting to look at this to help to situate the preceding discussion of Wing Chun. Most of the items on the list are actually about controversies and happenings in the world of karate which by 1972 had clearly surpassed Judo in terms of popularity and general “hipness.” It is what the cool kids were doing. However the second item on the list was a note about James Lee’s illness and his relationship with both Bruce and Jeet Kune Do. Once again readers are reminded that a new book in Wing Chun is about to be released. Yet this entire conversation is nestled within a larger discussion of the world of Karate. It is book-ended by a note about Chuck Norris (who ironically had just landed a role in one of Bruce Lee’s films) and complaints about the latest World Karate Championships in Paris that had resulted in multiple teams (including the Japanese) simply walking out. Wing Chun benefited from the more general growth of interest in the Chinese martial arts in this period. But that growth was still attached to, and in some senses subordinated to, the large movement of martial artists away from Judo (a grappling art) towards karate (a striking art). Systems like Wing Chun fit into this narrative precisely because they offered excellence in striking. Note that the “Black Belt” articles of the era almost never mention grappling, locks or throws in Wing Chun. They are certainly present in the system, but it was not what audiences were interested in. Conceptually speaking it does not appear that the Chinese arts had yet become their own “thing” in the mind of readers. While valued for their exotic nature and origins, for most individuals the investigation and practice of these fighting systems was still subordinated to other trends within the martial arts world. Perhaps the most surprising aspect of this article comes in the final lines of Peter Bennet’s introduction. After noting that Ip Man has retired from active teaching (indeed he would die in December of 1972, within weeks of James Lee) the author informed the readers that Leung Ting was his “successor” and was continuing to teach in Kowloon. We are then told that Wing Chun is taught in America by Tso Yue Kuen, a Chinese herbalist and student of Ip Man in San Francisco. This assessment of the state of Wing Chun in 1972 seems calculated to confuse rather than enlighten. Indeed it strikes me more as disinformation than anything else. While Leung Ting was actively teaching in Kowloon, he was certainly not Ip Man’s successor. Indeed many people more senior than Leung Ting, perhaps dozens of them, were also teaching Wing Chun in Kowloon at exactly the same time. Either James Lee or Bruce could have clarified this point in a few seconds, so one strongly suspects that they were not consulted before the article went to print. One can only imagine Bruce’s reaction upon reading that Leung Ting had assumed the leadership of the Wing Chun clan while Ip Man was still alive. The question of who was teaching Wing Chun in America is also equally interesting. I have never been able to find any specific details on Tso Yue Kuen. Yet there were clearly other Wing Chun practitioners in the US by 1972/1973 and some of them were actively teaching. Bruce Lee taught Wing Chun to a number of individuals, including James Lee. In San Francisco Kenneth Chung (a Leung Shung student) and Ben Der were both active in this period. In fact Kenneth Chung had probably been teaching since the end of 1968. Within a few months of the publication of this issue Augustine Fong would open his school in Tucson Arizona, and both Moy Yat and Duncan Leung would open schools in New York City in 1973. Wing Chun Kung-Fu by James Yimm Lee. I would now like to turn to Jame’s actual book. The text of this work had been in preparation for a number of years. Recall that the discussion of Wing Chun in the 1968 Black Belt special issue on the Chinese martial arts was pretty reminiscent of this later work. Still, few individuals actually saw a copy of the finished work before the death of its author. While it bears a 1972 copyright date, the book was not released to the public until very late in the year (probably December). Most readers encountered the text in 1973 or later. This is important as the world of the Chinese martial arts was different before and after this year. Bruce Lee’s 1973 film “Enter the Dragon” brought the Chinese martial arts to the attention of vast new audiences. While his personal practice was highly pragmatic, the on-screen image of the martial arts that Lee projected was romantic in the extreme. His character in “Enter the Dragon” managed to be both some type of Shaolin disciple and a British secret agent. Indeed it is hard to imagine that anyone other than Bruce Lee could have juggled such conflicting career trajectories. Other themes in the movie included enigmatic villains and tournament death matches all interspersed with deep philosophical meditations on the nature of the martial arts and violence. It seems likely that these were the sorts of expectations that new readers would have brought to the text. This was, as they were constantly reminded, the only style that Bruce Lee formally studied. And the cover of the book at least hints of the same theatricality. For that reason Wing Chun Kung-Fu is really most remarkable for what is not there. The text is direct and simple. Nothing unnecessary has been included. In fact, if readers were to walk away from the prose with any impression at all it would probably be one of ascetic discipline. This would come as no surprise to those who knew James Lee or were familiar with his earlier works, such as his Iron Palm training manuals. For him the martial arts were a purely practical, almost technical, exercise. Perhaps this is why he felt such a strong attraction to the highly utilitarian Wing Chun system in the first place. The book starts off with a discussion of the Yin-Yang symbol (often employed by Bruce Lee). The discussion is direct and seeks to ground the symbol in concrete physical experiences that anyone is familiar with. It is clearly written with the intent to clarify rather than to mystify. Likewise the following section is titled “A Brief History of Wing Chun.” The author was not exaggerating. The entire discussion of the art’s history (both ancient and modern), and fundamental nature runs less than 300 words. Immediately readers are moved into clear visual demonstrations of the basic stances, the concept of the “center line,” the idea of the “immovable elbow,” facing an opponent, footwork and the introductory form, “Siu Lim Tao.” I believe that the extensive photography of the form offered in this book remains some of the clearest and most easily understood ever published. Following this preliminary material a number of different self-defense applications are introduced. This is followed by a concise introduction to Chin Sao and other training methods. The volume concludes with a glossary of Chinese terms. The entire work runs a little over 200 pages in length. However most of this is photography and directions. There is actually very little discussion in the book. It is clear that this was an intentional choice on the part of the author. Other authors, such as Clausnitzer and Wong, managed to work quite a bit of discussion (some of which was very interesting) into their equally technical treatments of Wing Chun. But Lee seems to have felt that discussions which were not directly relevant to the topic at hand simply distracted from what was vital. He states in his introduction that he is aware that the media is generating interest in the Chinese martial arts, and that this will lead to a new wave of students seeking instruction. Lee believes that many of the people who are currently opening martial arts schools are not adequately trained themselves. Further, Lee carries an unusual degree of bitterness towards the time that he spent in the Southern Shaolin system and claims that he wants to help new students avoid the same pitfalls. As such he is going to show them the sorts of things that a teacher should address and do, rather than just discussing them in the abstract. Lee’s book has a timeless quality to it. Perhaps its very parsimony is what keeps it from feeling old or outdated. It is a great reference work for new Wing Chun students who are just starting to be introduced to a wide range of material. It breaks things down in clear and simple ways and shows what is essential to remember and focus on. This work continues to be widely read and used today. In fact, it’s the only book that I will be reviewing in this series that is still widely available and referenced. Today there are a sizable number of books on Wing Chun. Many of them are explicitly aimed at new students just learning “Siu Lim Tao.” Yet this volume remains the only one that my Sifu (and I suspect many others) is willing to recommend to his students. Due to its taciturn style it says nothing problematic, but it includes great illustrations of essential concepts and movements. Wing Chun Kung-Fu has gone through many printings. It has sold over 150,000 copies and has been translated into a number of different languages. There are very few technical books on the martial arts that can say the same thing. This single source has introduced more people to the actual practice of Wing Chun than any other printed work ever produced. It is absolutely ubiquitous, and it deserves to be so. 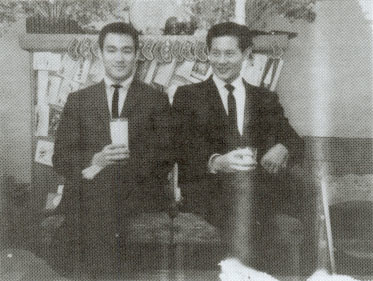 Bruce Lee and James Lee together. Authors have complex motivations for writing. Some seek wealth, others fame. Some have a burning need to communicate an essential idea or insight. Many of the best authors write seemingly because they cannot help it. James Lee wrote because he wanted to be respected. He did not want to be famous. He wanted to be a successful author so that his beloved wife (who also died of cancer) and young child could respect him and see the things that he had accomplished. And I think that he also wanted the respect of his many friends and acquaintances in the martial arts community. He wanted to be remembered for being something other than a welder. Within the martial arts community he found a type of respect and social status that was not granted to him by society as a whole. The admiration of his peers was freely given and very much deserved. 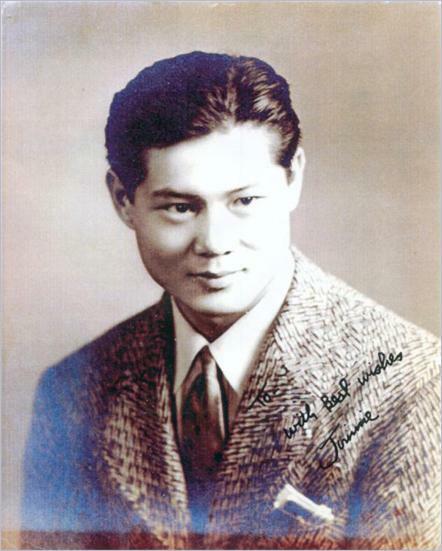 In the early 1960s James Lee was one of the most experiences and well-rounded martial artists in California. He had connections in many important places and many individuals came to him for advice. It goes without saying that Bruce Lee would not have become quite the same icon that he did without the friendship and support of James. He introduced him to weight lifting, the serious study of western boxing and Ed Parker (who subsequently helped to launch his career both in the world of martial arts and television). But James Lee, 20 years older than Bruce, was also a teacher and martial artists in his own right. This review of Wing Chun Kung-Fu only scratches the surface of a very interesting and instructive life. I hope to be able to consider him in greater detail at some point in my “Lives of Chinese Martial Artists” series. It is clear that Lee is not going to be forgotten in Wing Chun circles any time soon. His incredibly successful book on Wing Chun became a guiding light for those seeking a simple and direct introduction to the Chinese martial arts in the midst off the “Kung Fu Craze.” It continues to play the same role for countless readers today. Click here for Part III of our series on Print Media and Popularization of Wing Chun. As a former JKD student of James Lee, training at his garage in Oakland in ’71 & ’72, I believe that you have provided the finest biography of James Lee that I have ever read. Nothing but EXCELLENT. Gary Dill pdilljkd@aol.com. http://www.jkd-garydill.com. This Sifu has studied from 1955 and has started teaching wing chun from 1961 under the guidance of Yip Man. He was as well the sparring partner of Yip Man until his death as they share the same physics. Hi Bud, on the cover of the book by James Lee, is he using a phoenix eye fist? I ask this as I am away some styles of Wing Chun use is it along side of the standard vertical fist. I did a couple classes of Opera House in the late 90’s in london. Sifu Leung I think.